The cost of London hosting the 2012 Olympics is to rise to £5bn, according to organisers. 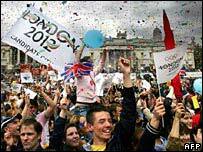 The original budget for London's bid to stage the Games, including the cost of regeneration, was put at £3.4bn. But Sir Roy McNulty, the head of the Olympic Delivery Authority, said the costs would be "significantly higher". He told the London Assembly that extra security, an unexpected VAT bill and government demands for a contingency fund have added to costs. Up to £1.5bn is also being asked to underpin the regeneration package for the Olympic site in the Lower Lea Valley, east London. Sir Roy McNulty and Olympic Delivery Authority (ODA) chief executive David Higgins appeared before the London Assembly to allay fears that the 2012 Games is in crisis. This comes after his predecessor Jack Lemley quit as chair last month amid claims the Games were in danger of coming in late and over budget. Mayor Ken Livingstone said the issue was "resolvable" and the taxpayer would not foot the bill. He said: "We are still in the early stages of what that additional cost may be but it will be in the order of a billion, perhaps a billion and a half, and clearly that is something that must be funded by the government." Mr McNulty said that the original budget had been put together without a full analysis of the site or fully-costed designs for new venues. He added: "Security costs have increased since two years ago and regeneration costs are significantly higher than was allowed for before. "I believe that an adequate contingency needs to be allowed for a programme that still has six years to run." Mr Higgins said the VAT bill, which had not been included in the bid by organisers, "could be resolved by technical adjustments". The government is expected to set the new ODA budget in February.